Absolute Monarchy – On the eve of the revolution, France had an absolute monarchy under Louis XVI. Under Louis, most people were denied basic rights and any say in government. Social Inequality – France had three social classes. The clergy were the First Estate. The titled nobility were the Second Estate. The Third Estate was made up of the rest of society including the bourgeoisie (middle class), poor city workers, and rural peasants (the largest group). The Third estate resented heavy taxes and lack of rights. wars spent more money than it earned (deficit spending). Taxes were raised on the Third Estate. have enough to eat and began to riot demanding bread. Enlightenment – Enlightenment thinkers criticized France’s absolute monarch and the tax burden on the Third Estate. They also called for democratic reforms. The Revolution Begins – As conditions worsened, demands for reform increased. In 1789, Louis XVI finally called the Estates General, a body made up of representatives of all three estates, into session. National Assembly – The Third Estate declared itself the National Assembly and vowed to write a new constitution for France. 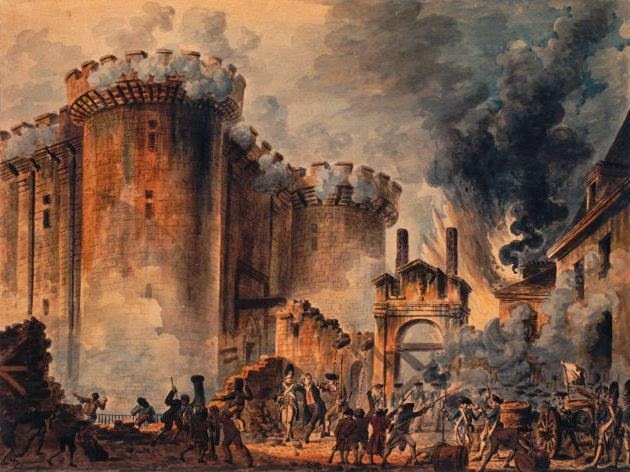 Seizure of the Bastille – Working class people already rioting over the price of bread stormed a prison called the Bastille on July 14, 1789. Fighting broke out through city and countryside. In a period known as the Great Fear, peasants attacked nobles and destroyed their homes. Moderates in Power – The king was frightened by the continuing chaos and agreed to allow the National assembly to begin reform. Declaration of the Rights of Man and of the Citizen – The National Assembly abolished the privileges of the First and Second Estates and adopted the Declaration of the Rights of Man and the Citizen. It was based partly on the Declaration of Independence and contained many Enlightenment ideas. A Limited Monarchy – By 1791, the Assembly had written a constitution. It set up a limited monarchy and a representative assembly. It declared that people had natural rights and it was the government’s job to protect them. It put the Church under state control. Many European monarchs felt threatened by the events in France and threatened to invade France to save the monarchy. In 1792 France declared war on Austria, Prussia, Great Britain and several other countries. Radicals in Power – The war with the other European nations went badly for France. 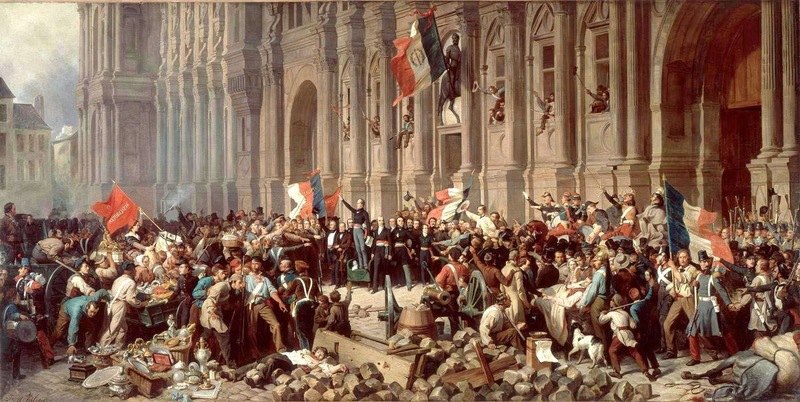 In 1792 radicals took control of the Assembly, ended the monarchy, and declared France a republic. Their slogan “Liberty, Equality, and Fraternity” was symbolized in their flag, the tricolor. In 1793, Louis XVI and his wife Marie Antoinette were executed for treason. The events that followed are known as the Reign of Terror in which Maximilian Robespierre, a radical revolutionary, had tens of thousands of people executed. 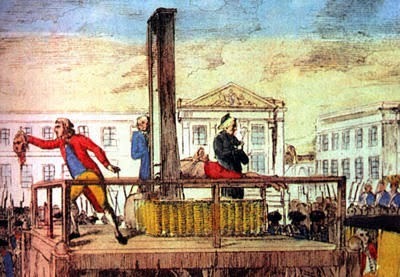 The guillotine became a symbol of this period. Within a year, the violence turned against itself and Robespierre himself was executed. Moderates Return – Beginning in 1795, a five-man “Directory” supported by a legislature held power in France. This government was weak and ineffective. Rising bread prices brought the threat of riots. Soon, a dynamic military leader would emerge. His name was Napoleon Bonaparte.